Lavandula latifolia (latifolia meaning broad leaved) flowers in August at altitudes between 200-600m above sea level. The zone where the last two Lavenders meet is around 500m above sea level. At this altitude they cross-pollinate and a new hybrid is born, Lavandula x intermedia, or more commonly known as 'Lavandin'. 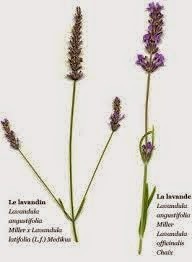 On the left 'Lavandin', has inherited the lateral branching from Lavandula latifolia. Lavandula angustifolia in unbranched, just a straight flower stalk. The Latin name for lavender is Lavandula, derived from the Latin word ‘lavare’ meaning washing. 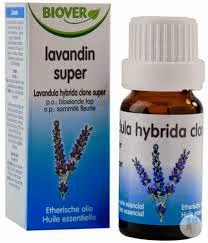 The Romans used Lavandula stoechas and Lavandula latifolia to perfume their baths and clothes. These were the Lavenders, that were more easily available, growing near the coast and a bit inland. Both Pline the elder (scientist, naturalist and philosopher, personal friend of Emperor Vespasian, 1st century AD). 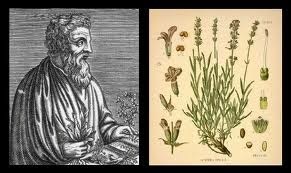 Dioscorides (a Greek, but worked as a physician in the Roman armies 1st century AD, author of the book Materia Medica, a herbal used up to the 15th century) mentioned lavender in their writings. 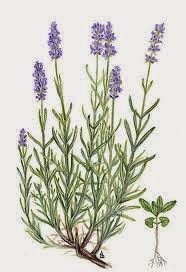 From the 1st century onwards Lavender pops up regularly in medical text. Lavender was one of the herbs that was grown in the monastery gardens in the 14th century. In the 16th century, records show that Lavender was being distilled to obtain essential oil. They used it to treat sores and against vermin. 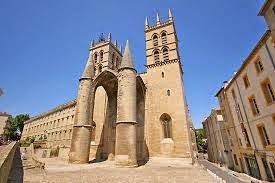 The medical centres in Montpellier founded in the 13th century and Marseille founded in the 15th century encouraged the cultivation of aromatic herbs. Plants were the principal cure for ailments until the discovery of chemical synthesis in 19th century. It was thought that bad odours resulted in illness and pleasant smells promoted healing and prevent illness. During the last plague epidemic in the 18th century, the archives mention enormous quantities of aromatic plants being used in medicine, burnt inside the houses and on the roads to fight against the plague. It was in the second half of the 19th century when the ‘wild pick of lavender’ developed in Provence. In the same period there was a large exodus of people leaving the countryside, from Mt. Ventoux to the valleys of the Verdon, the limits being the mountains of the Vercors and pre-Alps. These people were very poor, the land was unproductive and as there were more and more new industries being created in the cities, they abandoned the land, left it as was, erosion took place exposing the rocks underneath, only the strongest plants could survive. Lavender quickly covered the abandoned hills. During the harvest, the pickers noticed that some of the Lavenders were larger than the others. They just called them “grosse lavande”. These plants were a cross between Lavandula angustifolia and Lavandula latifolia. This is brought about by insects, in particular bees, who transport the pollen from one flower to the next. 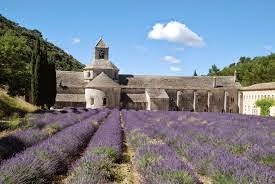 Only in 1927 was this fact confirmed in a laboratory in Grasse when they artificially pollinated Lavandula angustifolia with Lavandula latifolia. The name given to this newly discovered Lavender was ‘Lavandin’, its Latin name being Lavandula x intermedia. Lavandin being a hybrid is in principal sterile. It cannot produce plants from seeds or grains, only from cuttings, that also explains the sameness when you look at a field of Lavandin. As the demand for perfume and cosmetics grew. Partially because it was fashionable at the time, but also because the population in the cities grew. 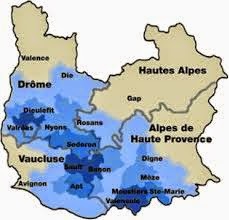 In particular Grasse, its prosperity based on 3 industries, olive oil, leather and the perfumery industry. The countryside around Grasse produced olives and hides from the sheep. For the manufacturing of soap and cosmetics you need oil, in this case olive oil. To give the products a pleasant smell they used the essential oil of plants that either grew naturally or were being cultivated in the area (jasmine, rosa centifolia, violet, mimosa and of course lavender). From the 19th century onwards Grasse was knows as the capital of perfume. Expressions Parfumées - Grasse - Producer of 100% natural fragrances certified Ecocert. A supplier to the big perfume houses and other parts of the cosmetics and beauty industry. Parfumeries Fragonard Independent perfume house in Grasse - with perfume museum. Jean Niel - Grasse - Family run company producing fragrances since 1779. The perfume houses installed distilleries in the countryside close to where the Lavender was being picked. Local families and families as far a field as Italy would descend into the hills in July. This harvest continued to grow till it reached its peak in 1920’s-1930’s. 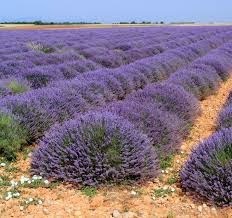 It was only between 1925-1930 that the cultivation of Lavender in fields, as we know it today, started. For example in 1923, 100 tons of Lavender was being picked – 90% from wild pick. From the 1950’s the ‘wild pick’ hardly existed. In 1956 the lavender production was 80 tons only 10% from ‘wild pick’. In the 1980’s the production was 50-80 tons and no more ‘wild pick’. Lavander is normally sown. 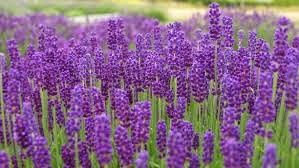 There is a cloned variety called Lavandula angustifolia ‘Maillette’, named after M. Maillette, who selected the plant. Nowadays, 40-50 % of all Lavender is planted with this variety. It is of a slightly lesser quality than the sown Lavender, but because of its selection, it has a larger flower head, which results in more essential oil. The cultivation of Lavandin started of slowly from 0 in 1925 to 1000 tons in 1980.
till it got a sickness and was then replaced by another cultivar called ‘Super’. Nowadays only 10-15% of the fields are planted with ‘Abrialis’ and less than 10% with ‘Super’. Most of it is planted with Lavandin ‘Grosso’ selected by M. Grosso from Goult in the Vaucluse. 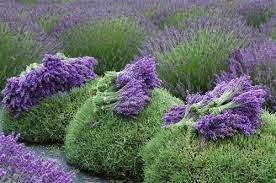 The production of Lavandin has increased whilst the production of Lavender has decreased. 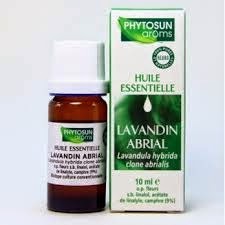 There are several reasons for this, the yield of Lavandin essential oil is greater than that of Lavender plus Lavandin grows at lower altitudes, the land is flatter, it is easier to create the fields and at the same time easier to harvest with machinery. The large industries that use Lavender in their products are not interested in quality more in quantity. 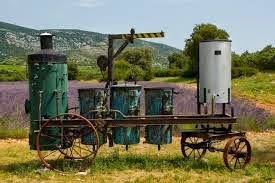 Today the production of Lavender has gone down to about 30 tons. 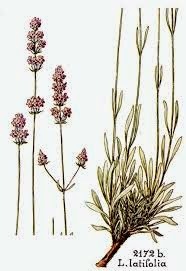 Essential oil of Lavandula angustifolia is one of the few essential oils that can be used pure onto the skin, particularly for insect bites or small burns. It is a tonic for the nervous system; it calms, emotionally it harmonises; it relieves fear, tension and negative thoughts, helps with palpitation and is a muscle relaxant. The different Lavandins have similar properties, just not as effective. 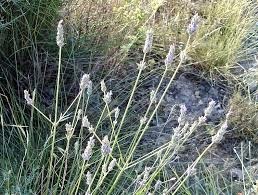 Lavandula stoechas has antiseptic, anti-spasmodic properties. It has to be diluted before use to treat chronic sinusitis, bronchitis and upper respiratory infection. Not to be used pure or on babies, children and pregnant women. · Simplest way is to put a few drops on a hanky and inhale. · Bath: add 7 drops of essential oil to the bath water. 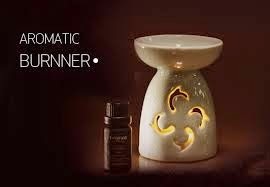 · In an aromatic burner, first add water to container, put 6 drops of essential oil onto the water, light the tea light. · In a base cream: 12-65 years add 20 drops to 50 gr of cream; 65+ add 10 drops per 50 gr of cream. 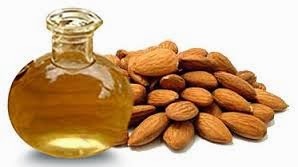 · In a massage: 12-65 years add 10 drops per 20 ml of carrier oil, almond oil is good for the skin and not too expensive; 65+ add 5 drops per 20 ml of carrier oil, almond oil is good for the skin. The common name for Cistus is Rock Rose. Cistus are native plants to our region, growing in the wild in the garigue and maquis. Our climate is harsh and plants that can exist unaided in the wild should be looked upon as a starting point when thinking of plants for our gardens. 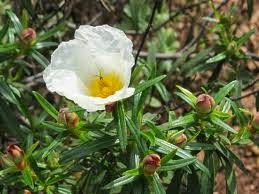 and Landanifer which is a true gum Cistus having large white flowers and long narrow sticky dark green leaves. From the range of wild Cistus many beautiful garden hybrids have been developed and it is worth finding a Pepiniere that specialize in plants for dry gardens as their Cistus will all be named. In a garden centre they are just mainly called Cistus and one does not know how they will look. Nearly all Cistus have single 5 petal flowers ( like a wild rose) which have a delicate look of crushed tissue paper. They flower from May to July which is not a long period but is well worth waiting for. The flowers appear in the morning and petals fall in the late afternoon but they are abundant. The flowers of the different varieties come in different sizes and the colours are white, or pale pink to almost magenta all with yellow centers and on some varieties a brown or wine coloured sploge at the base of each petal. The shrubs are evergreens so make all year interest especially if kept in shape. Most Cistus prefer alkaline soil though there are a few that prefer acid. They can take a lot of heat so do well in full sun but can cope with dappled shade and look good in a setting of mixed varieties under larger trees being very happy under our native pines and evergreen oaks. They are happiest in poor but well drained soil and need little water and no feeding. Planting time is May to September. When planting add no organic material or fertilizer but if possible add gritty sand. Water the hole you have dug and check that the water drains away quickly, if not find a dryer place. Soak the root ball a little but do not tease out the roots as they are very brittle. Do not plant deeply. Do not feed. Cistus are very happy in a gravel garden. Many experts say no pruning, only take off flower stems after flowering. I find that they soon get straggly and if you prune carefully they grow denser. Pruning can be done after flowering or around September or anytime you see tiny new buds lower down the stem or branch. Never cut in to old wood or lower than two new pairs of buds. Cistus are said not to sprout from old wood but occasionally I find new shoots near the base of the plant. Cistus are most easily propagated by cuttings. This is recommended in September- November or early Spring, though I take some whenever I feel like it. Take the cutting from a none flowering side shoot about 12 to 20 centimeters long, or with about 5pairs of leaves. 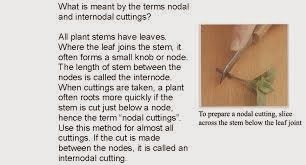 Pull off the two lowest pairs of leaves and make a clean cut just below the lowest node. Sometimes I take a heel cutting by tearing a shoot from it's stem. Dip the cutting in hormone rooting powder and insert around the edges of a pot filled with damp compost mixed 50/50 with gritty sand and some vermiculite if you have any. I put quite a few cuttings in a pot in the hope of some success. Depending on the time of year put a plastic bag over the pot for a short time. When they look happy remove the bag and leave the pot in a sheltered place until they have rooted and then repot them individually. When they start to send out side shoots and are growing upwards nip out the growing tips to encourage them to thicken up. Within a year they should be ready for planting . 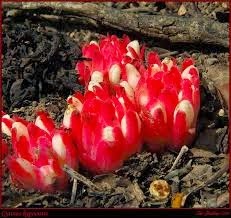 In the wild the native species seed freely and have very hard seed casings which can lay dormant for years but when subjected to great heat,as in forest fires,will crack open into activity. This applies to many plant seeds in the Garique and Marquis. Cistus are usually problem free but can be come the host to a parasite called Cytinus which takes nourishment from the roots of the host. 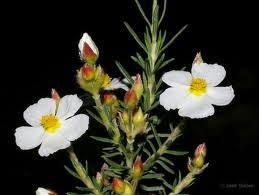 They have nothing to recognize them by other than at flowering time they produce small bright flowers at the base of the Cistus. On Cistus Albidus they are bright red and white. I have never come across this but will now look out for it. Cistus have only one commercial use and this is from the Gum Cistus group. They exude a highly aromatic resin called Ladanum or Labdanum. This has been known from ancient times and was used in incenses, it is still invaluable in the perfume industry. Ladanum, which comes from Cistus Creticus, is found , as the name suggests mainly in Crete. 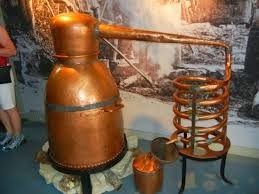 The Ladanum is harvested today in the same way as it was by monks hundreds of years ago. This is done by flaying the bushes with an ancient tool still in use today. The tool is like a two foot handled rake but with two cross bars. 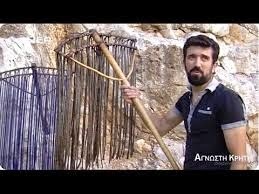 From these, instead of tines, hang down leather straps ( plastic these days). The shrubs are lashed with these and the resin sticks to the straps and is then drawn off, rolled into balls or little cakes and sent to market. This is laborious work as it must be done when the sun is at it's hottest and the resin is released. Herodotus noted 2 thousand years ago that goats were left to graze on the hillsides. The resin stuck to their beards and was then combed off. 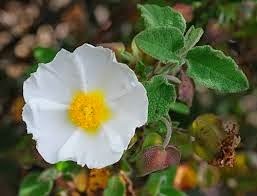 Historically, in Greek and Turkish Folk Medecine, Cistus were used for a great variety of ointments,potions and infusions for everything from the plague,scurvy and hair loss to rheumatism and asthma. 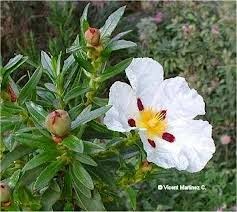 In Spain Cistus Clusii is still used as an anti inflammatory and for skin inflammation . If you are interested in learning more about Cistus may I recommend a website to you . Produced by Robert Page at cistuspage.org.uk. Despite living in Yorkshire he used to hold the National Collection of Cistus and has bred and named many new varieties and I think would be considered a world authority .